Red Steel 2 was released on March 23 this year. We last looked at Red Steel 2's reported game-play hours on September 24. The game-play hours in that report were recorded on September 20, and I compared them with two other FPS Wii games. You can read the last report HERE! It has been 99 days between the data reported from September 20 and the data reported on December 27. 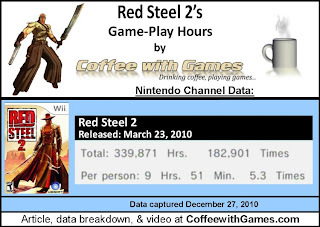 How many hours have Wii owners reported playing Red Steel 2 in the last 3 months? Let's take a look! 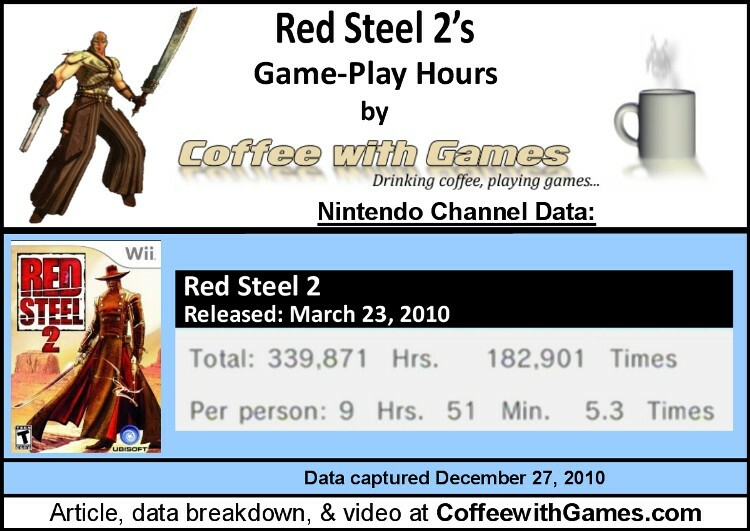 Red Steel 2 now has 34,509 Wii owners reporting their game-play hours through the Wii's Nintendo Channel. Red Steel 2 has seen an increase of about 9,577 gamers reporting play-time data, since the data recorded on September 20. Red Steel 2 now has 339,871 Total Hours of game-play reported, an increase of 98,535 Total Hours since the last report. The average play-time for Red Steel 2 is 9 Hours 51 Minutes "Per person" reporting data, and the average play-time per session for Red Steel 2 is just over 1 Hour 51 Minutes. Red Steel 2's Amazon.com sale rank is #782, and the current advertised selling price is $17.94. The Red Steel 2 Wii MotionPlus bundle's rank is #1,964, and is currently selling for $39.23. Both versions of the game are selling from third party vendors on Amazon.com, and the sales ranks and advertised prices were recorded on December 29, 2010 around 11:55PM. Red Steel 2's review score average is still 80.85%, based on 46 "professional" reviews on GameRankings.com. Red Steel 2's Amazon.com customer review score average is a 4.5 out of 5 Stars rating, based on a total of 49 customer reviews between both versions, with and without Wii MotionPlus. Review score averages recorded on December 29, 2010 around 11:55PM. I still haven't played Red Steel 2, but seeing the game's lower sales prices now, is really an encouragement for me to buy it and try it. I think seeing almost another 10,000 Wii owners reporting their game-play data, in the 99 days between reported data, is really good for Red Steel 2; especially when considering the game doesn't have any online multi-player or leaderboards. Did any of you receive Red Steel 2 for Christmas this year, or purchase it with some Christmas money? If so, and you have had a chance to play it, what do you think of it? If you haven't played Red Steel 2, are you interested in playing it? If you have played it, would you recommend the game now with its lower prices? I had a chance to play it up to the early first bossfight. It does seem like a game I'd enjoy playing, but honestly it didn't feel like anything more than a solid, good looking hack/slash/shoot game with slightly more activity needed by the player since it's not button presses but gestures. Not that that is a bad thing, but the "story" presentation and flow of the game didn't strike me as particularly awesome. Maybe it gets better later on, but it is not a game to blow me away. Probably with all the talk about it, I thought it would be a really high production value game, but while the graphics are a good choice in style and it does feel like a solid game, it isn't an exceptional title where you can feel the production value in every little detail. Can't really explain it too well, but it's just not there. Maybe it is the b-movie style it went for when it comes to characters and story and all that. Still, for a decent price I'd buy it if I hadn't too many games to play(although personally I would go for Epic Mickey over this if I hadn't already) All on my PC through steam though. Can't beat getting 5 games like Darksiders/Batman/Dead Space and whatnot for the price of one already cheaper Wii game. Intesting remarks so far. I'm about to post a review on this game shortly - I got this and Wii Sports Resort with a Motion Plus a few months ago - and just hadn't gotten around to it. The reviews were good, but it kept getting back burnered. Now that I got to play it? I'd say it was a lot of fun, but it was combat mechanics that deserved a better storyline and game around them. The combat was awesome, but throughout the progression of the story was sort of 'meh' in my opinion. Definitely worth a lower priced pickup, but I did pay a bit more than I wish I had now I guess. The other thing that amused me in the comments is I am a new convert to Steam over the last few days (how about those holiday specials right now?) Gotta say - some of their deals are hard to beat. Tonight? I picked up the block breaking game 'Shatter' that scored a 9.0 on IGN for the PS3. It retails there for 7 or 8 bucks, and I got it for 2.50 tonight. Hard to beat that. I always miss Target's gaming sales. I see them online, but when I show up at the stores and check the clearance games, I never find anything like I see online! I wonder if the Target clearance/sales games are more of a localized thing with certain areas/stores. I don't play games on my PC anymore, I really need to invest in a better GPU and PSU, because I'm going to start doing some more video editing anyway...and Steam seems like it's always having good deals on games. I read your review for it, and it seems to be inline with some other's comments and thoughts on the game I have read. A lot of people seemed to enjoy the graphical style/approach for the game, but the length and replay value seemed to be things people talked about a lot as issues. Even if you did work for Ubisoft, it wouldn't matter if you really do enjoy the game. I wish developers would speak out more on their own thoughts and opinions on their games, but I'm sure publishers have agreements and reasons they don't want that to happen sometimes. Thank you all for the comments and feedback! If anybody wants to read Chalgyr's review for Red Steel 2, the link is: http://chalgyrsgameroom.blogspot.com/2010/12/red-steel-2-nintendo-wii-review.html. Does anybody else have any thoughts Red Steel 2, or did anybody receive the game over the holidays and just start to play it? The second is to play red steel in the first-person perspective, gives a very realistic feel. This game set with the Wild West and the Far East mix between modern touch. This is ridiculous, you can combine these two themes at the same time using a samurai sword, and use another time around.